Our nursery is a clean, warm and welcoming environment where the safety and security of your child comes first. 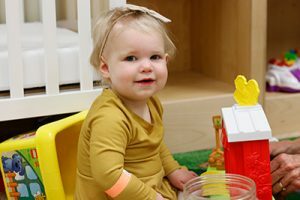 We offer a caring and nurturing setting for newborns through the age of three. Our nursery volunteers receive individual training after successfully completing a criminal background check. We use a secure check-in and check-out procedure and some of our volunteers have completed pediatric first aid and CPR training.